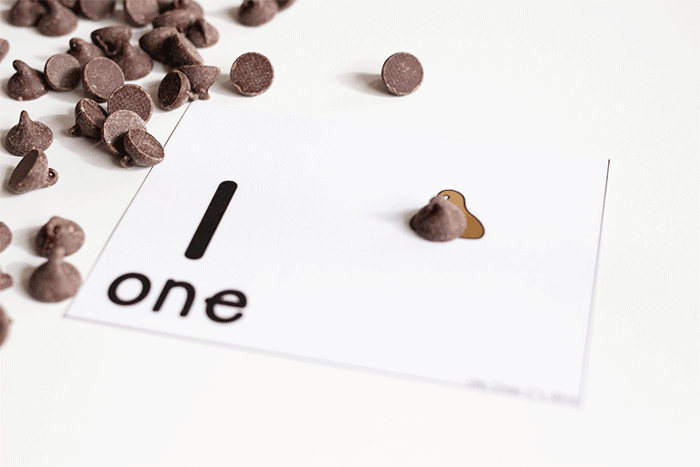 Chocolate chips. 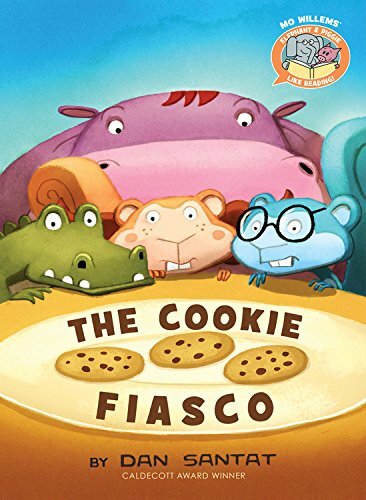 They are cute, they make cookies & pancakes even more delicious and they make fantastic manipulatives for preschoolers practicing counting! One thing I have learned over the years is breaking up the monotony of teaching activities is crucial to helping kids WANT to learn. 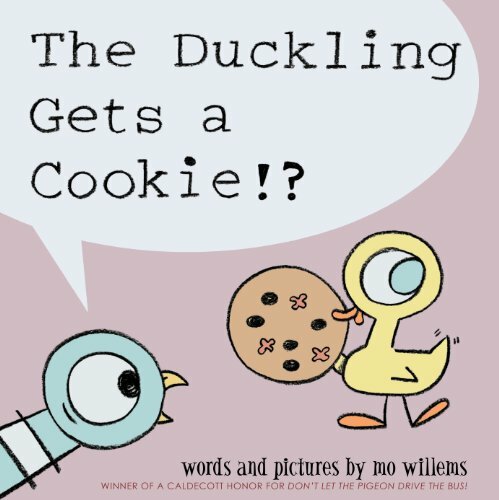 Some children have a knack for being especially excited for any type of learning, but that is not always the case. I have tried multiple ideas but the one thing that always helps is to mix things up. 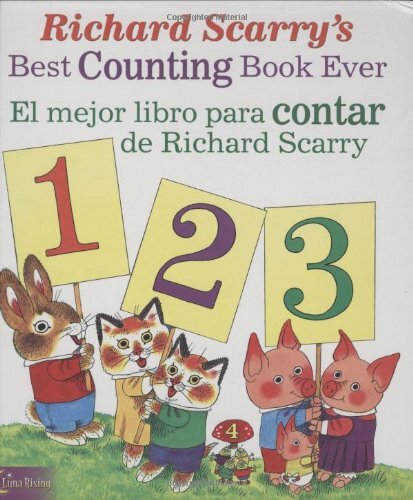 So yes, we use quite a few counting cards to help practice beginning counting, but the themes are always different! These Chocolate Chip themed counting cards are our favorite right now!! 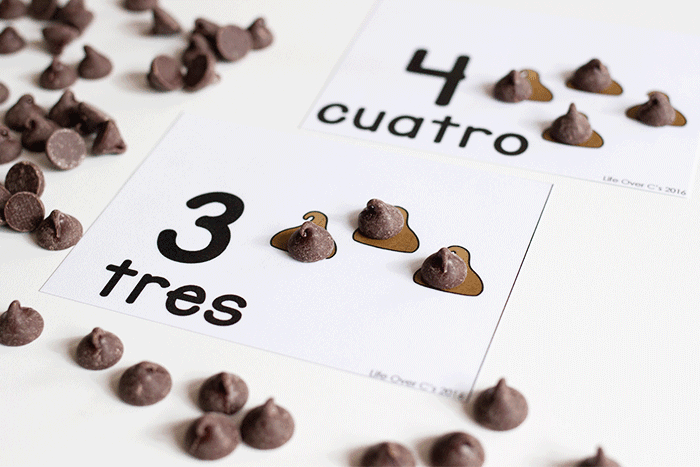 I am super excited about these counting cards because I have included a Spanish version too!! 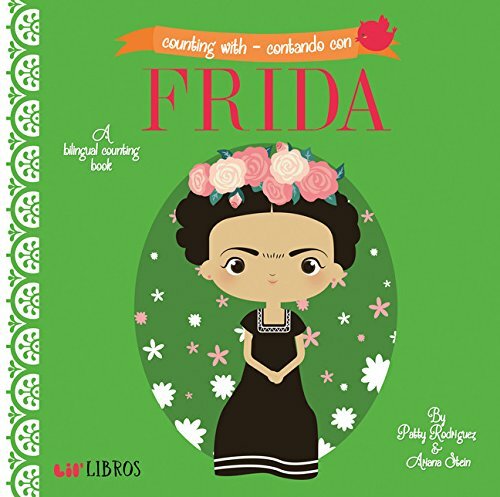 So if you have a need for Spanish math materials, these make a great choice. 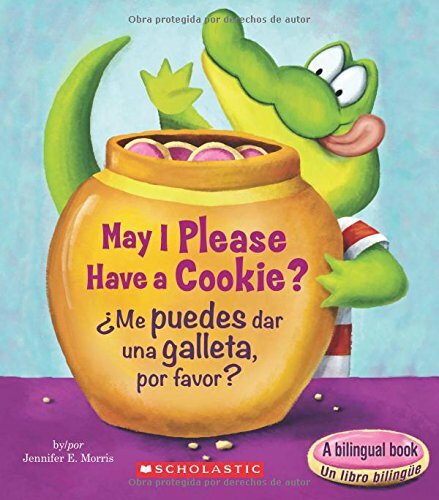 Perfect for bilingual classrooms, immersion classrooms and supporting English language learners. 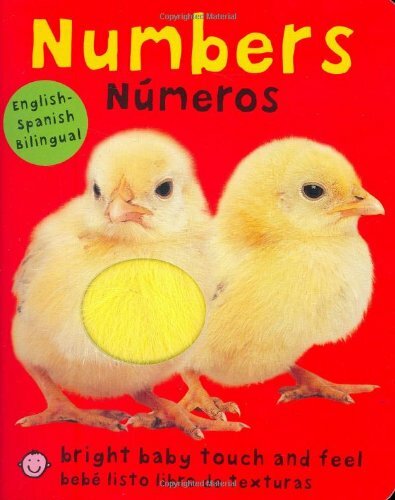 I’m definitely not fluent in Spanish, but I can count to 10, so I didn’t have to turn to Google translate at all…lol! 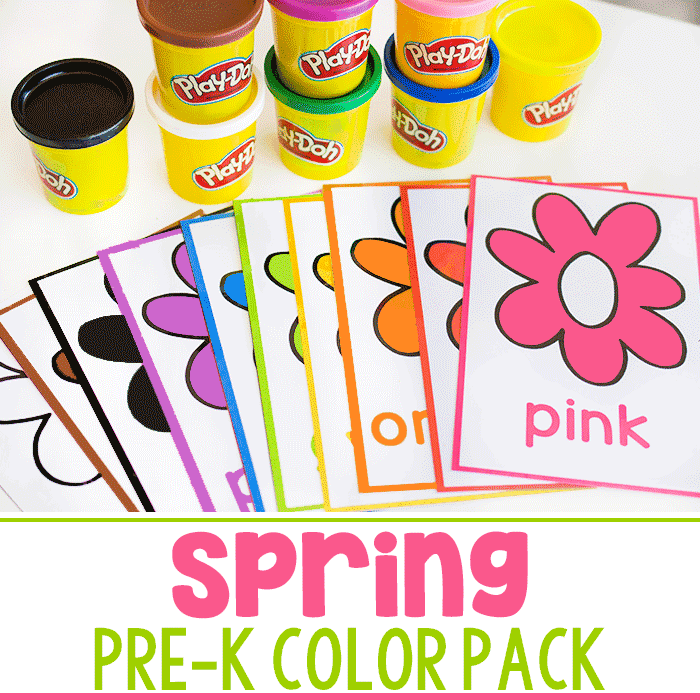 The preparation of this activity is super simple. Who doesn’t love simple activities? 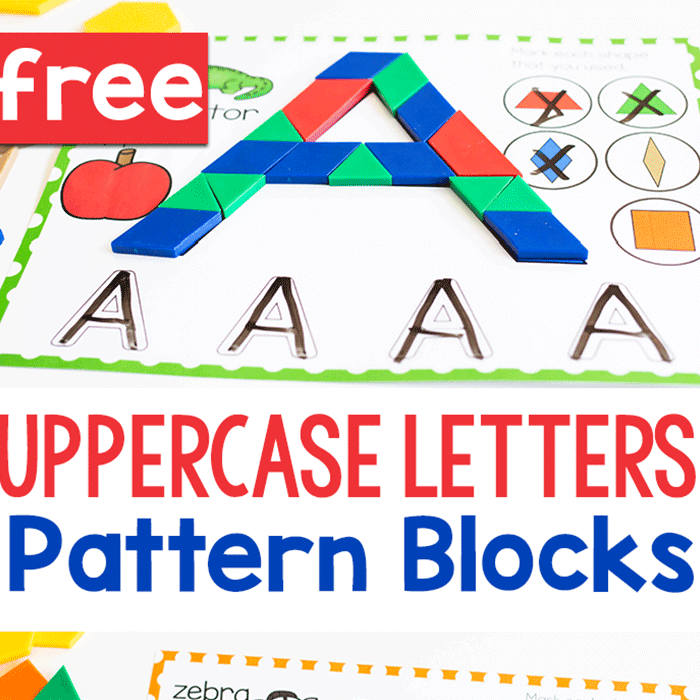 I personally love activities that are super simple to prep and one that my kids can play over and over. It’s like a win, win, win! 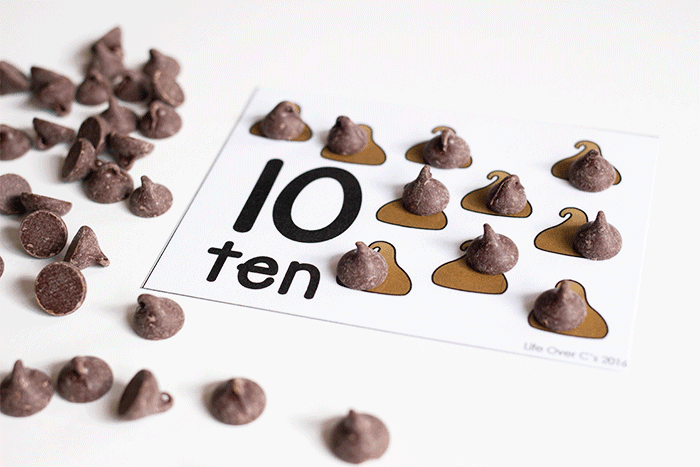 First I print out all of the counting card sheets. The next thing is to cut the cards apart. I like to laminate the cards. This is completely optional, but I prefer for activities that I prep to last for longer than one play session. HA. Kids will bend, fold, or some how at least one of the cards will get wet. So I laminate them. I also love playing with my super fast laminator. It was an investment, but it saves me so.much.time. 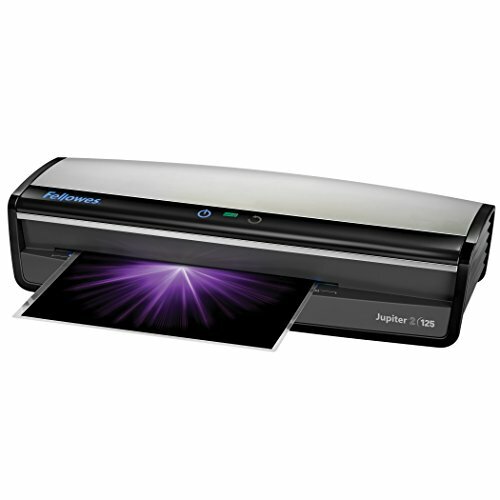 It makes laminating less optional and more necessary! I recently saw a reader slip an entire page of counting cards into a write & wipe protector which is genius! 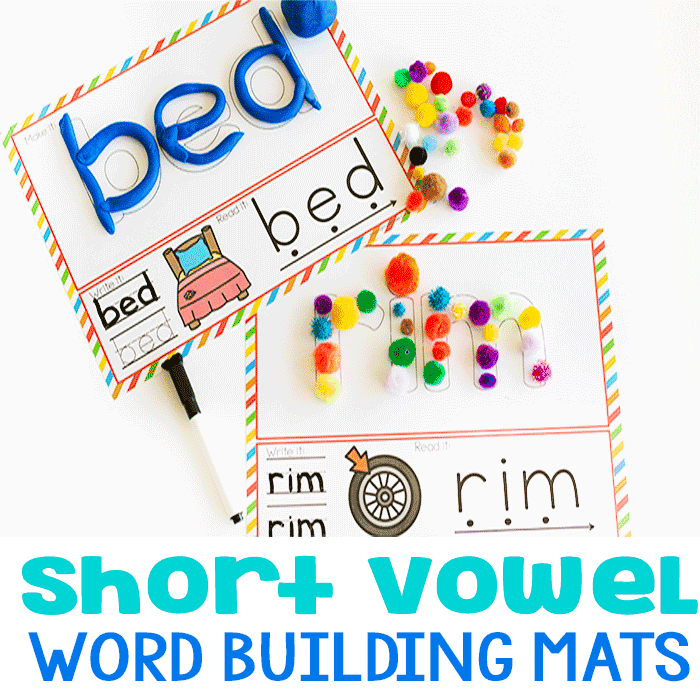 A great way to save time on laminating and cutting! Grab one of the card variations. You can choose from the small cards or the half-page cards. The small cards are great for kids who can get distracted by extra pictures. 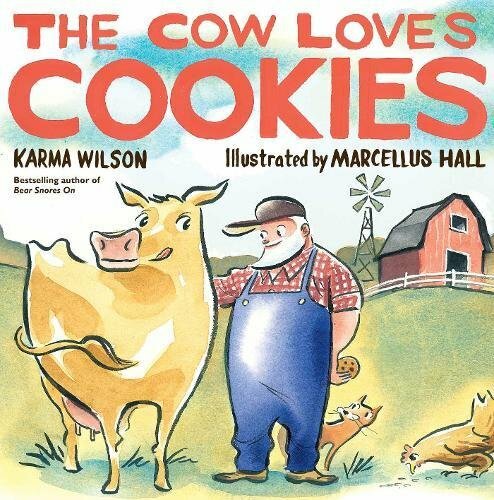 And once they become more fluent with counting, you can move them over to the half-page cards with the images of the chocolate chip cookies on them. I put the the cards in a stack. They can be in numerical order or all mixed up. 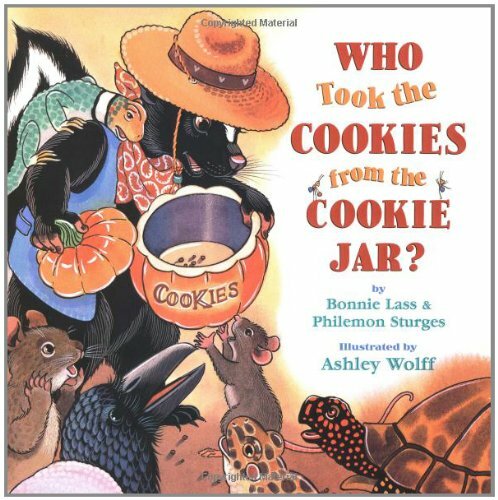 The children can pick one and start counting. 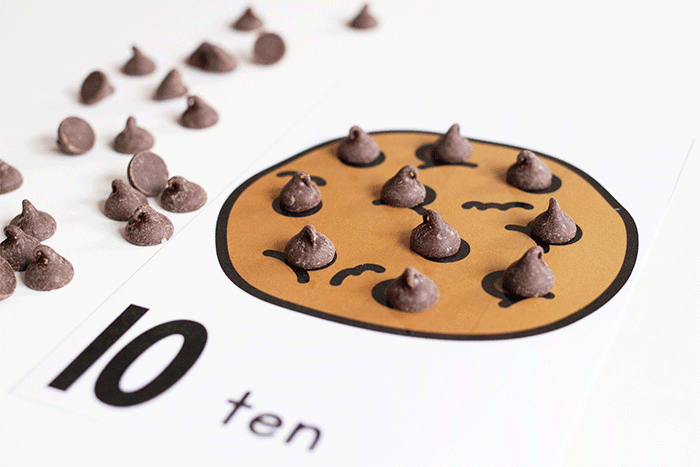 Using chocolate chips to help children count to the number on the card by putting chocolate chips on to the pictures of chocolate chips. 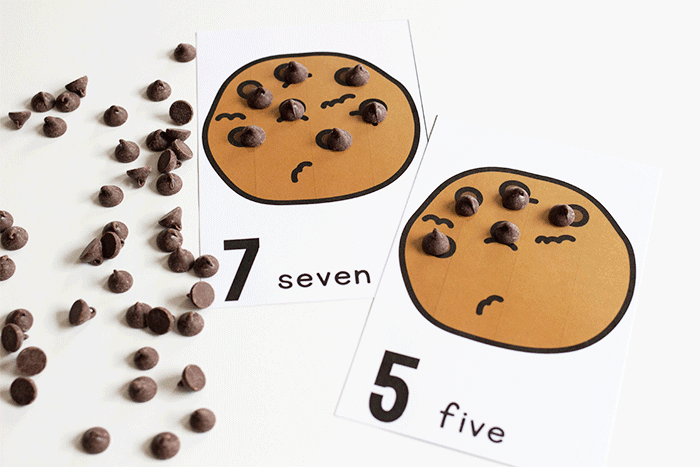 These cards are excellent for preschoolers who are not quite ready for independent counting. It can help them know when to stop. 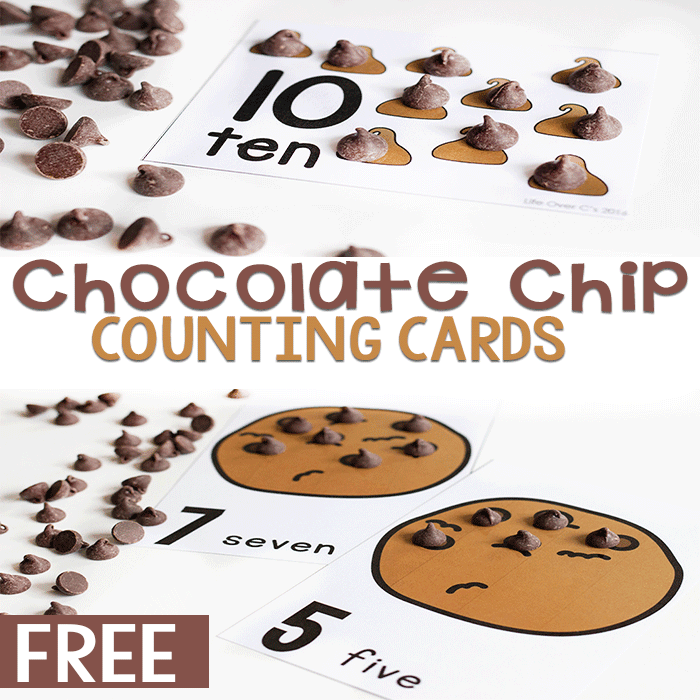 These counting cards are excellent for individual use or in small groups. 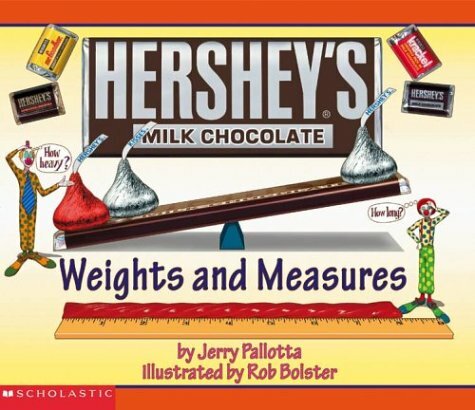 It can be fun to extend the life of this activity, especially if you are a chocolate lover like I am. 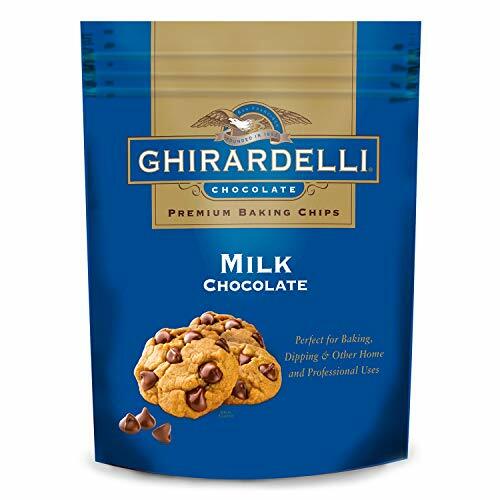 You can make chocolate chip cookies, puppy chow, or pumpkin chocolate chip bread. 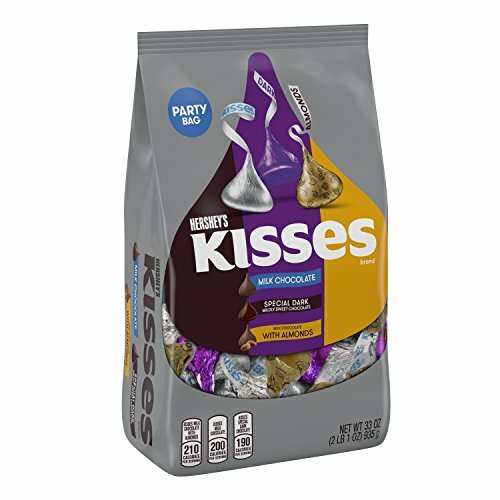 Use white chocolate chips or peanut butter chips instead of chocolate. 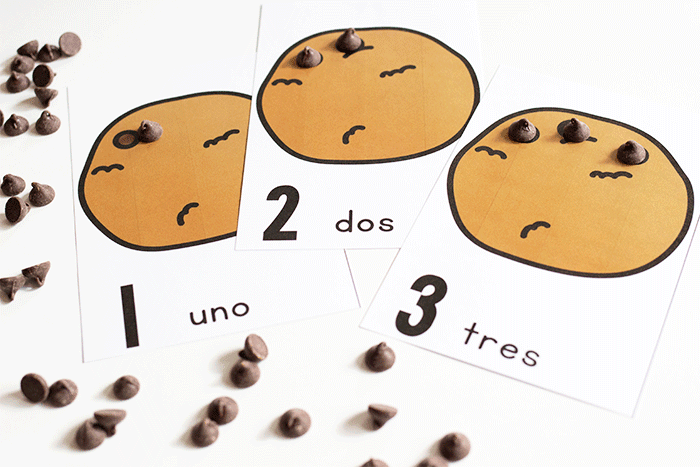 Use the counting cards to do simple addition or subtraction. 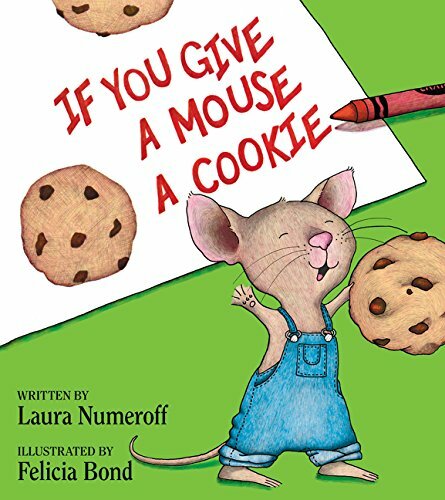 Thanks for these-they are perfect for our “Give a Mouse a Cookie” day!